When you initially launch a chart, the time roll-up is set to one minute. 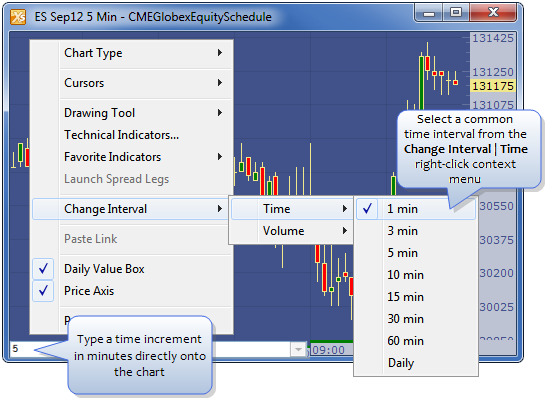 You may change the time or volume interval via the chart’s context menu or by typing an increment directly on the chart. X_STUDY charts support time intervals ranging from tick-by-tick up to 1440 minutes (the number of minutes in a day) and volume intervals ranging from 50 to 999,999. Right-click the chart to display the context menu. Select Change Interval and Time (or Volume). This displays a list of common increments. Select an increment. X_STUDY redraws the chart using the selected time increment. Bring the chart into focus. Type the increment directly on the chart. If changing the Time increment, type a time increment in minutes. If changing the Volume increment, type a volume increment followed by the letter V. This displays the interval in the lower-left corner of the chart. Press the Enter key. X_STUDY redraws the chart using the increment.